I’m a huge oatmeal fan! So huge I used to eat oatmeal every single day… #obsessed. 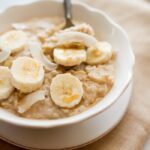 Over the years I’ve shared so many healthy oatmeal recipes and it’s definitely still one of my all-time favorite breakfasts! It’s so warm, comforting and healthy. Plus, I’m a volume eater so I love the fact that with oatmeal I get to eat a huge, delicious bowl in one sitting. 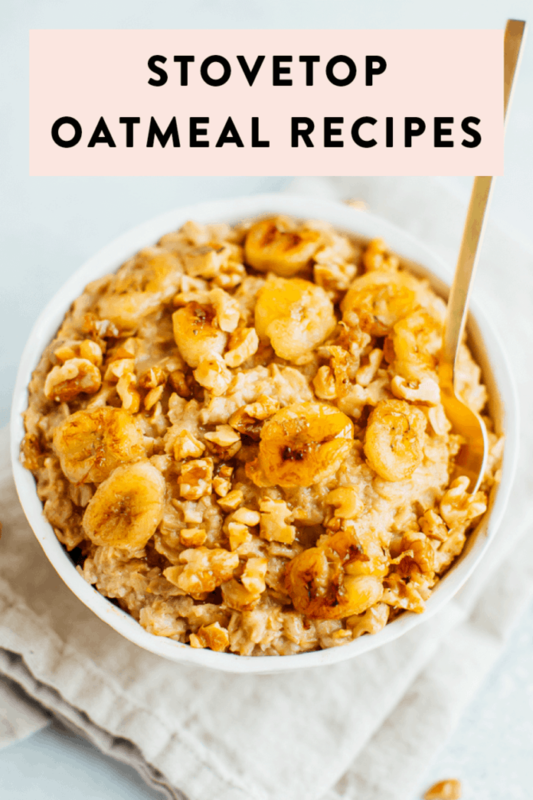 In this post I’m going to break down everything you need to know about oatmeal, why it’s so good for you and share a bunch of healthy oatmeal recipes you need to try today! What are the health benefits of eating oatmeal? I will say, the little packages of oatmeal often have a lot of sugar in them, so it’s always best to make your own! What are the different types of oatmeal? Steel cut oats: these are the least processed oats. The oat groat (the full oat “grain”) is cut into two or three parts to get to steel cut oats. Here’s my go-to cooking method for steel cut oats. Old fashioned/rolled oats: oat groats that have been steamed and then rolled which speeds up the cooking process for all of us at home. Quick or instant oats: these are the most processed of all the oat varieties. They are pre-cooked, dried, and rolled and pressed slightly thinner than rolled oats. They cook faster than than steel cut or rolled oats, but they also lose a bit of texture in the cooking process so they tend to be mushy. While steel cut oats are less processed than regular rolled oats, there are only minor differences nutritionally. Steel cut, old fashioned/rolled, and quick oats all have approximately the same amount of fiber, protein, calories, and other nutrients. 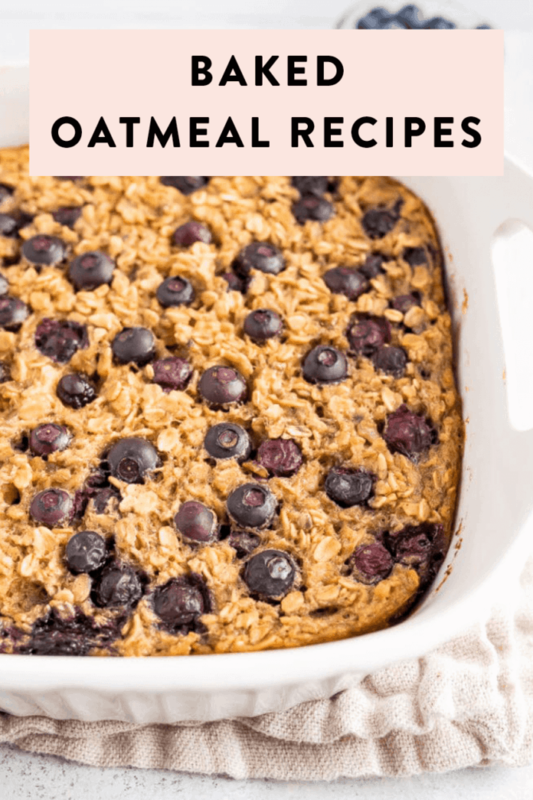 I personally don’t view one type of oatmeal better than the other, but I tend to prefer steel cut oats and rolled oats for breakfast recipes but use quick oats for baking sometimes. Quick oats work great for my healthy no bake cookies! There are SO many ways to cook oats. For real! You can bake them, cook them on the stove top, make them in the slow cooker, make overnight oats or even make oatmeal in the microwave. 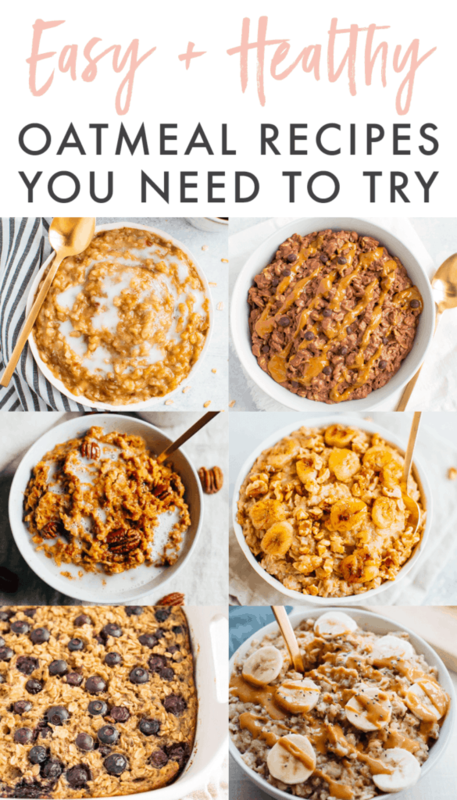 I’m sharing all of the different ways to make oatmeal below but the key to making *good* oatmeal?! It’s the mix-ins and toppings! I love mixing in fruit, nut butter and a variety of flavors to take my oatmeal to the next level. No more boring bowls of oats! A basic healthy oatmeal recipe with instructions for how to cook old fashioned oatmeal on the stovetop or in the microwave. Add oats, water or milk and salt to a pot over medium/high heat. Bring mixture to a boil, reduce heat and continue to cook for about 5-7 minutes; stirring occasionally. You oatmeal is ready when the oats have soaked up most of the liquid and are creamy. Transfer to a bowl and add your favorite toppings. To make old-fashioned oats in the microwave: add 1/2 cup oats and 3/4 cup liquid (water or milk) into a microwave-safe bowl and stir to combine. Microwave for 1 minute, then stir and continue to microwave in 30 second increments, stirring between each, until the oatmeal is the consistency you like. I usually cook them for a total of 3 minutes, but you’ll know it’s done when most the liquid is absorbed and oats are hot. Carefully remove from microwave (bowl will be hot) and top with your favorite oatmeal toppings. Savory Oatmeal – A savory oatmeal bowl with an egg, avocado, tomatoes and little parmesan. This bowl has a great combination of healthy fats, protein and carbohydrates. Healthy Salted Caramel Oatmeal – This warm and gooey salted caramel oatmeal is swirled with an easy date caramel sauce giving it that perfect blend of sweet and salty. Banana Bread Oatmeal with Caramelized Bananas – Basically my dream dessert in breakfast form. Enjoy this gourmet but super simple breakfast! Sweet + Savory Egg and Oatmeal Combo Bowl – Don’t knock it ’til you try it, okay? This breakfast is sweet, savory and the perfect combination of protein, carbs and fat. 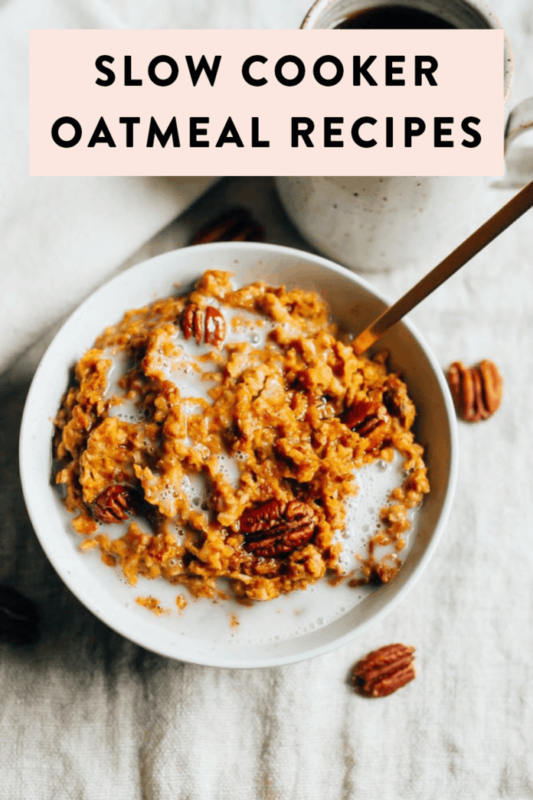 Protein Pumpkin Oatmeal with Egg Whites – Packed with protein and flavor, this oatmeal is one of my go-to’s throughout fall! Zucchini Bread Oatmeal – Your entire kitchen will smell like zucchini bread after making this healthy breakfast! What could be better? Cinnamon Raisin Oatmeal – A tried and true favorite, this cinnamon raisin oatmeal is super easy to make and oh so delicious. This recipe will make you want to ditch those instant oatmeal packets! Peanut Butter Banana Chia Oatmeal – Packed with fiber and protein, this delicious bowl of oatmeal will leave you full all morning long! Plus, what’s better than peanut butter and banana? Tropical Oatmeal – Nothing warms me up like a bowl of oatmeal on a cold morning especially if it involves flavors that make me think of white sand, suntan lotion and piña coladas. Blueberry Peach Oatmeal – This oatmeal is best when blueberries and peaches are in season but still one of my favs year round! Date Sweetened Apple Pie Oatmeal by Minimalist Baker – You simply can’t go wrong with date sweetened oats that taste like apple pie. Everyday Oatmeal with Amaranth, Coconut and Maple Sautéed Apples by 80twenty — Kris had me at maple sautéed apples. Spiced pear oatmeal by The Roasted Root – Spiced pears = perfect for fall. Apple Ginger Cashew Cream Oatmeal by Will Frolic For Food – Love the addition of ginger. Brownie Batter Peanut Butter Swirl Oatmeal by Fit Foodie Finds – Anything that looks like chocolate sauce but is also a breakfast food is good in my book. Morning Glory Oatmeal by Cookie + Kate –Carrots, coconut milk and spices. Need I say more? Baked Blueberry Oatmeal – This blueberry baked oatmeal is studded with blueberries and naturally sweetened with bananas and pure maple syrup. Can be made with fresh or frozen blueberries! 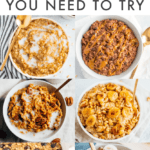 Baked Oatmeal Cups 4-Ways – Keep these baked oatmeal cups in your fridge or freezer for an easy, healthy breakfast! There’s four different flavor options so you’ll never get bored. 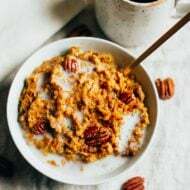 Maple Pecan Baked Oatmeal – This baked oatmeal is fancy enough to make for brunch or just as meal prep for ready-to-eat breakfasts throughout the week! Healthy Baked Chai Oatmeal Cups – If “cozy” could be used to describe food, this would be the time. 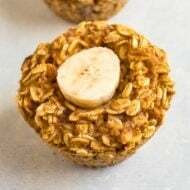 Baked Banana Oatmeal Cups – Oatmeal cups that taste like banana bread? Sign me up. Baked Pumpkin Oatmeal Cups – Make ahead oatmeal cups that are portable. Road trips, work breakfast… these are your friend! Pear + Sage Baked Oatmeal by What’s Cooking Good Looking – I would never think to add sage to oatmeal but I’m so glad that Jodi did. This combo sounds amazing. Dark Chocolate Chunk Cheesecake Baked Oatmeal by How Sweet It Is – Because sometimes you really do need chocolate at breakfast. Baked “Apple Pie” Oatmeal by Naturally Ella – In case you can’t tell, if there’s apple pie involved, I’m in! Blueberry Oatmeal Bake by Nosh and Nourish – Kelly’s husband said it tasted like cake so basically I HAVE to try it. Strawberry Rhubarb Apple Oatbake by A House in the Hills – This looks like dessert, but it’s for breakfast. Woot! Baked Carrot Cake Oatmeal by Green Kitchen Stories – Omg. This looks so good. Slow Cooker Pumpkin Pie Oatmeal – Enjoy pumpkin pie for breakfast! I love waking up to my house smelling like a fall wonderland! Slow Cooker Apple Cinnamon Oatmeal – No time to wait for steel-cut oats to cook in the morning? Make them in your crock pot the night before. Overnight Autumn Steel-Cut Oats by Fitnessista – Pumpkin pie spice, dried cranberries and apples cooked overnight in the slow cooker. Delish! 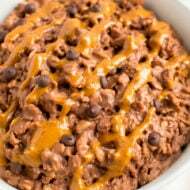 Crock Pot Samoa Steel Cut Oatmeal by Fit Foodie Finds – Any recipe with a Girl Scout cookie in the name automatically gets my attention. Can’t wait to make this! I had no idea it was National Oatmeal Day! It’s one of my favorite foods too. Your post also introduced me to some new blogs. Thanks for sharing! These look superb! Happy National Oatmeal Day everybody! I like your taste in blogs! Except for that Fit Foodie Find’s…she’s a character… 😉 Kidding! Love all of the blogs and all of the recipes!! Happy National Oatmeal Day! BEST ROUND-UP EVER! Pinning and stumbling! Oh perfect! Its just getting cold here in LA, which means oatmeal in the mornings! Oh how I love a good bowl of oats! I can confirm it – eggnog IS in stores now! I’ve resisted buying it, but I think I am going to give in for the sole purpose of making that eggnog oatmeal. 🙂 There is just nothing like coming in from a dark and cold run and sitting down to a steaming bowl of magnificent oats. Thanks for the roundup! Love this round up! Especially the Dark Chocolate Chunk Cheesecake Baked Oatmeal. Oatmeal is so quick and easy in the morning, I’ll be anxious to go through all of these to mix it up a bit! Your brown sugar apple brown oatmeal link does not work. Can you fix it so I can check it out? WOW! That’s a ton of new blogs for me to check out, and I love oatmeal. Nailed it. So many options!